crayons and cylons: Bloggerstock: What's Your Theme Song? Bloggerstock: What's Your Theme Song? Ladies and gentlemen, blog readers of all ages, I'd like to share with you the wonders of today's post! 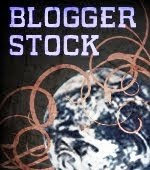 Today is Bloggerstock day. "What is Bloggerstock?" you may ask. It's like a blog swap, but on a grander scale. It takes a group of bloggers, this time around 30 different 20-something bloggers will create a blog-ring all focusing on the same topic, "What is your theme song?" If you follow the links today, you should be able to gain exposure to a wide variety of blogs, some of which you may never have read before. That means Ashes from Just the Ashes will be posting her blog here today. She's a great photographer and is moving to Korea soon to teach English! I'd say she's a pretty brave woman to venture halfway around the world on her own. When I signed up for Blogger Stock, I didn't know what the topic would be, but I definitely liked the idea. However, I was worried that I wouldn't have anything interesting to write about. I was relieved when I saw the topic would be my theme song. There's always been one song that I've always related to, probably even from the first time I ever heard it. That would be Wide Open Spaces by the Dixie Chicks. I was never really a country music fan, but I've always loved the Dixie Chicks. Especially this song. I feel like it could have easily been written about me, and I think that that's an important quality in order for you to consider a song your "theme song". The main idea of this is following your dreams. Leaving your home town and everything that's safe and comfortable to find your place in life, even if that means taking risks and making mistakes. It's about putting yourself out there just for the sake of trying to do something with your life, even if you don't even know yet what exactly is it that you want to do. It's about being okay with making mistakes because you know you'll learn and grow from them. It's about doing all of this even when others, especially those close to you, tell you that you shouldn't. This is something that really hits home for me. At 16 years old, I started counting down the days until I was 18 and could move out. It's not that I was miserable at home. Not at all. I just knew that there were bigger and better things about there for me than the tiny little town I grew up in. And when I turned 18, that's exactly what I did. I had a leased signed for an apartment before I even graduated from high school, and moved down there as soon as I possibly could. I even stayed there during summer and school breaks when college wasn't in session. I just knew that this was where I belonged, not in my home town. I just graduated from college and now I have even bigger plans. Much to my parents dismay, I've applied and been accepted to teach overseas in Korea for a year. I know it's somewhat risky and my parents would rather I stayed here, but this is my adventure, and my life. It's what I want and need to do. You can find me, Kara, over on the lovely Shinxy's page Vacuous Ramblings. Shinxy's one of the elite founders of Bloggerstock and lives halfway around the world from me. She's a super interesting girl and Pokemon master. Check her out! I'm a recent college graduate planning to teach English in Korea next year, a community support worker for children with mental disabilities, a girlfriend, an animal lover, a photographer, a Mac user, an obsessive Blackberry user, a crocheter, a scrapbooker, a daytripper, a daughter, a sister, a cousin, a friend, a soon to be auntie and anything else I decide I want to be. Thanks Kara! You did a great job setting this post up. It looks awesome. I am not a big country music fan either, but this is a great song. Following our dreams is probably the most important thing we can do. I always tell people: "If you are not happy doing what you are doing, than you are doing the wrong thing!" Good luck with the move to Korea! Best of luck to you on your move! I know other people who have done the same thing and greatly enjoyed it. My husband goes to Korea occasionally for work, and if I've learned anything from him, be adventurous in your eating. A lot of the food looks intimidating but is DELICIOUS! Different, but good. And since you sound like an adventurous kind of girl, you'll handle it quite well. I'm not a country girl at ALL but the Dixie Chicks are maybe the only country group that can pull at my heartstrings. "Travelling Soldier" does it every time!! I'm not a country music person at all, but I did really enjoy the idea behind the song!